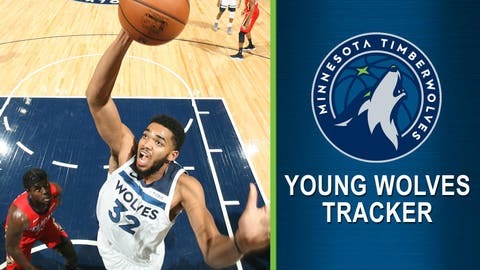 This is the 3rd edition of the 2018-19 Young Wolves Tracker. You don’t have to give him a present, but Towns turned 23 on Thursday. He played in his last game as a 22-year-old in Minnesota’s win over New Orleans on Wednesday and went out in style, scoring 25 points with 16 rebounds. Towns had double-doubles in all three Wolves games last week, starting off with 39 points and 19 rebounds on Nov. 9 at Sacramento, following that up with 25 points and 21 rebounds on Nov. 12 vs. Brooklyn and then the game against the Pelicans on Nov. 14. Towns passed 3,000 career rebounds in that first game and recorded 5,616 points and 3,055 rebounds before he turned 23. Only one other player in NBA history had 5,000+ points and 3,000+ rebounds before turning 23 — Dwight Howard. His 14.6 VORP (value over replacement player) ranks 19th all-time among players aged 23 or younger, and he still has another year to climb up the charts. Towns has a 0.6 VORP in the early going this season and in the past two seasons has had a 5.3 and 5.5. If he can add just 3.0 to his VORP, he’d be in the top 10, tied with someone named Michael Jordan. — Robert Covington was thrown right into the mix. Minnesota’s newest forward started in his debut and played 41 minutes, posting 13 points, seven rebounds, two assists, two steals and a block, and had box score plus/minus of +4. — The other newcomer, Dario Saric, came off the bench and played 20 minutes with nine points, three rebounds, an assists and two steals with a +9. — Rookie Josh Okogie had the best box score plus/minus on the Wolves last week with a +14. He had 11 points in just under 17 minutes against New Orleans. — Second-round pick Keita Bates-Diop played for the Iowa Wolves of the G League on Nov. 10 and had 20 points and 10 rebounds. He was recalled to Minnesota the next day but did not play in any games for the Timberwolves.